Take part in a wonderland of good-will by playing in the World-of-Good Game Show, decorating do-good images with bright jewels and making get-well cards to be delivered to children's hospitals. Every participant will be entered into a raffle to win a Nintendo Wii! A Nurse from Downstate SUNY Medical Center will be accepting cards and speaking of the positive impact get-well wishes have on hospital patients. 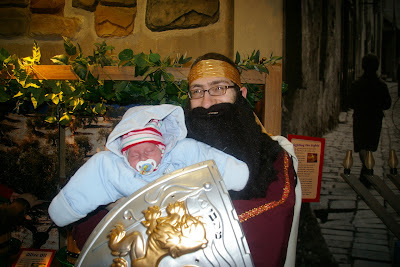 Author and Lecturer Rabbi Shmuley Boteach toured the Museum, bringing seven of his children along for a three hour journey through the exhibits. 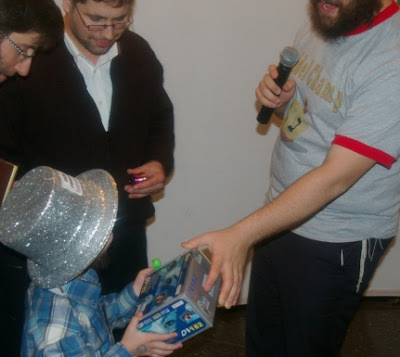 At the end of the tour, while the Boteach children played near the humongous Dreidel in the Museum entry plaza, Shmuley told Executive Director Yerachmiel Benjaminson, "This Museum sets a new standard in excellence. It's phenomenal." Rabbi Boteach's latest book, The Broken American Male, And How to Fix Him will be published next month. He has just launched a Jewish values-based initiative called "This World." Hundreds of visitors and Macy's shoppers were treated to a special Chanukah Wonderland on the 34th Street Macy's kids floor on Sunday. Children took part in an olive-press workshop led by Judah the Maccabee, who cracked jokes and gave a riveting account of the Chanukah story. The Menorah was lit using the freshly squeezed oil. 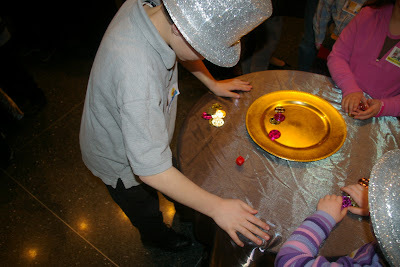 Children made Chanukah "Jewelites," decorating Chanukah images with bright Jewels. All children took home Dreidels and chocolate coins! ...on what will it land?! The tournament crowns a champ! A winner takes home a video camera! 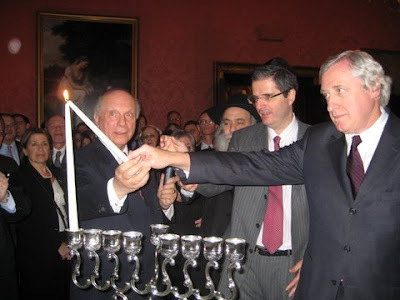 Ambassador of France to America made a special appearance to light the Menorah. 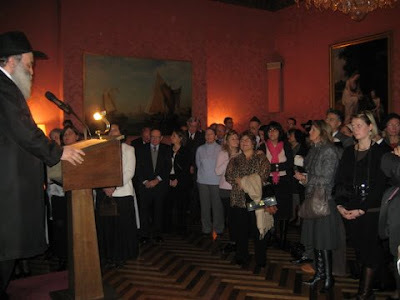 The Chanukah celebration was hosted by Consul General of France Mr. François Delattre. 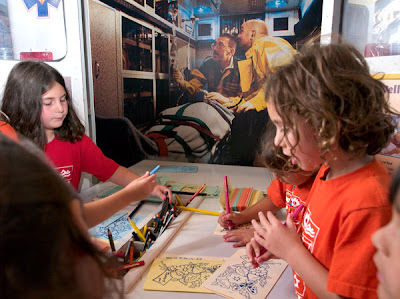 The Jewish Children’s Museum in New York received a $10,000 grant for afterschool education.The Nissan Foundation, the philanthropic arm of the Japanese automotive company, awarded the grant to the Brooklyn-based museum in recognition of its multicultural educational program.The money will support “Creative Kids,” an afterschool program that exposes children of all backgrounds to Jewish culture and traditions. Last year, 500 children aged 9 to 15 enjoyed arts and crafts, dance, nutrition, computers and homework tutoring through the program. Established in 1992, the Nissan Foundation provides grants to approximately 10 organizations each year, with a preference for educational programs that foster awareness among cultures. The Jewish Children's Museum will be celebrating the first night of Chanukah tonight at a Menorah lighting and dinner reception at the French Consulate. The Jewish Children's Museum will be bringing their Chanukah Wonderland to the Chanukah celebration, which is being hosted by Consul General of France Mr. François Delattre. “Chanukah Wonderland” at Macy’s in Manhasset on December 2nd. This season, the Jewish Children’s Museum in Brooklyn, NY, is collaborating with Macy’s to bring its “Chanukah Wonderland” to the kids floor. 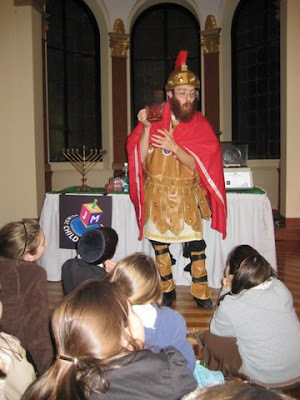 Kids joined Judah the Maccabee for a hands-on olive oil workshop and Menorah lighting ceremony. 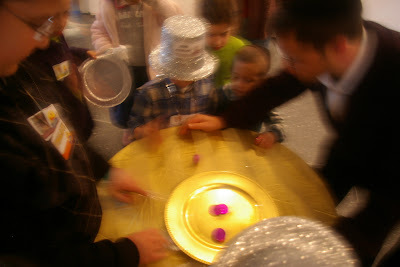 Kids also decorated Chanukah images with bright jewels and all received Chanukah gifts. Sunday December 9th at 1pm. 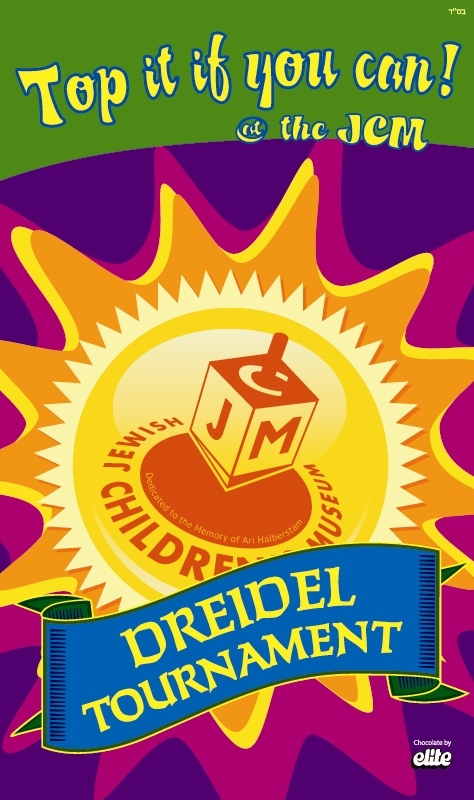 Museum Announces Chanukah Dreidel Tournament! 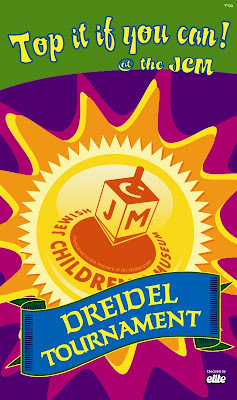 The Jewish Children's Museum announced today that its entire second floor will become grounds for a competitive Dreidel Tournament. Four playoff brackets will feature competitors face to face, taking turns at spinning to score. Depending on how the Dreidel lands (see rules below), teammates will either advance or be ousted from the tournament. After each suspenseful countdown, team points will be tracked using tournament coins. After each team crowns a finalist, the two competitors will don gold ribbons and duel in a final round off. The playoff will produce a Dreidel champion, who, along with scoring prizes for the entire team, will win a video camera. Every player starts with 10 coins. There will be 10 coins in the pot at the center of the table. The youngest child at the table will start the game. The arrows on the table indicate the direction of play. Each player spins a Dreidel at his/her turn. When a player gets a “ג” (“Gimmel”) → he/she takes all the coins in the pot except for one, and all the other players put one of their coins into the pot. When a player gets a “ה” (“Hei”) → he/she takes half the pot. (If the pot contains an odd number of coins, the player takes the smaller half). When a player gets a “נ” (“Nun”) → he/she does not take any coins from the pot or put any coins in the pot. When a player gets a “ש” (“Shin”) → he/she must put two of his/her coins into the pot. On Wednesday November 14th, billionaire business mogul Lev Leviev concluded his week-long visit to the U.S. with a two hour private tour of the Jewish Children’s Museum. Leviev, who was joined by his 13 year old son, took great interest in all the exhibits during the tour, which was partly led by the Museum’s Executive Director, Yerachmiel Benjaminson. For the second time in a month, Chief Rabbi of Israel, Yona Metzger, visited the Jewish Children’s Museum. This time, however, he was joined by his wife and three of his children. Rabbi Metzger was very proud to explain his family the exhibits and encourage them to get up close and hands-on with the displays. The whole family laughed while crawling through the Challah Tunnel on the gigantic Shabbos table exhibit; danced, touched and smelled their way through the Holidays; and played a lively game in the Game Show room. “It’s amazing what the Museum is doing to spread awareness,” said the Chief Rabbi. Rabbi Metzger’s youngest son Elimelech, 7, had a blast, running excitedly to every exhibit while calling his older siblings to join. Rabbi Metzger took the visit as an opportunity to bring Judaism alive for his son, and asked Elimelech trivia-style questions related to each exhibit. 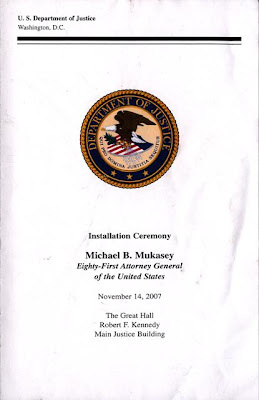 Last week, Judge Michael Mukasey was officially installed into office as the new Attorney General of the United States. At the 2006 Jewish Children's Museum Dinner, he received the Ari Halberstam Memorial Award. His award was mentioned in the ceremony's official booklet (above). 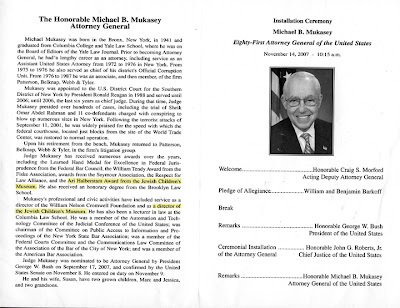 Judge Mukasey is also on the Museum's Honorary Board of Directors. World’s Greatest Department Store to Host Workshop Wonderland Celebrating World’s Greatest Miracle. The Jewish Children's Museum announced that they will be bringing their “Chanukah Wonderland” to the Macy’s Kids Floor in two separate Macy’s locations. The Children will meet Judah the Maccabee, who will lead Children in an olive-oil-press workshop, where they will be making their very own olive oil. The workshop will imitate the process the Macabees used 2,000 years ago, to make the refined oil they used to light the Menorah. 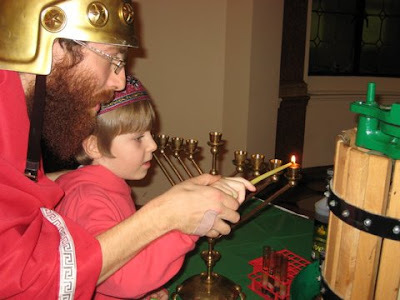 Using real life olive presses, children will squeeze the oil that Judah will use to light the Menorah. Children will make “Jewelites” - decorating classic Chanukah images with bright Jewels – and receive Chanukah gifts. The kids will use a real olive press, made of wood and cast iron. The children sort and hand-press fresh olives, then decant the olive juice to quickly extract the pure olive oil. As the olive oil is refined, the children will hand spin wicks out of cotton and then use the resulting oil to light the Chanukah Menorah with Judah. 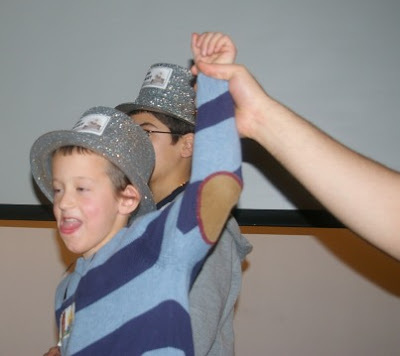 The kids will decorate Chanukah “Jewelites” and receive Chanukah gifts. The Chanukah holiday commemorates the Jews’ victory over the mighty Greek empire in the year 139 BCE. After the Greek king, Antiochus, issued oppressive anti-religious decrees against the Jews and desecrated the Holy Temple, a small band of warriors, the Maccabees, joined to fight him, against great odds. Following their miraculous victory, the Maccabees restored the Holy Temple and began to search for pure olive oil with which to kindle the Temple’s Menorah. Although they found only enough oil to light the Menorah for one day, the oil miraculously lasted for eight – hence, the eight-day Festival of Lights. For more information on Chanukah visit www.Chanukah.net.